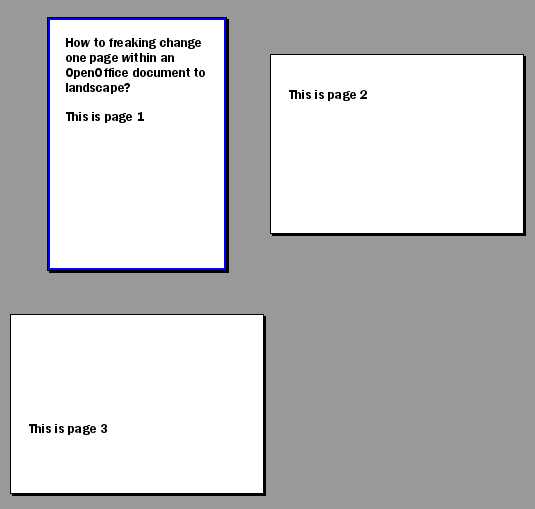 First, OpenOffice deals with page styles. 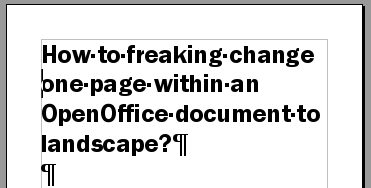 If you ever visited one of those cheesy “Office” classes at University or Company your life has probably evolved around using styles and you ditched manual formatting to a very dark place, right? If not, then it might be worth learning about using styles in your documents asap. 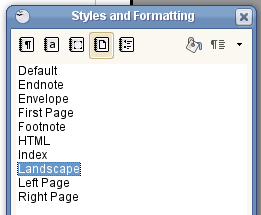 Anyways, open up the “Styles and Formatting” dialog (most likely by pressing F11 or using the “Format” menu) and use the top icons to select the “page styles” view. Right click onto the styles list and create a new page style. Change the orientation to “Landscape” and add it. Like on my screenshot above, it should now be listed there. Now we are going to apply the style to a document with three pages. We want the second page to display in landscape mode, while the rest should remain in portrait mode. Now move your cursor to the last paragraph of the first page and use “Insert > Manual Break”. 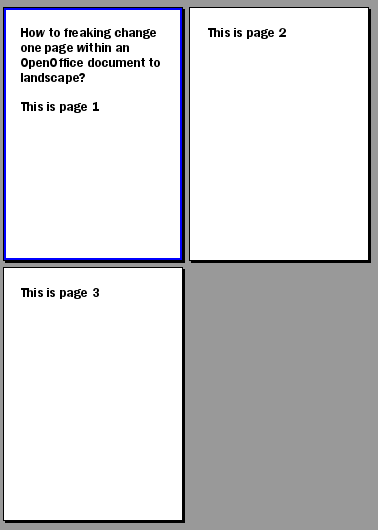 Select “Page break” and our new “Landscape” style. Oh, nice the page is landscape now, omagad must tell my boss, wife, parents, teacher, lector, dog and ze world! Well, we are not just there yet. All following pages also now use the “Landscape” style and are also in landscape mode now. This is not what we wanted. To fix this simply go the last paragraph on the second page and do another “Insert > Manual break”, but this time you choose the “Default” style. Now let someone rub your back as you have finally made it. 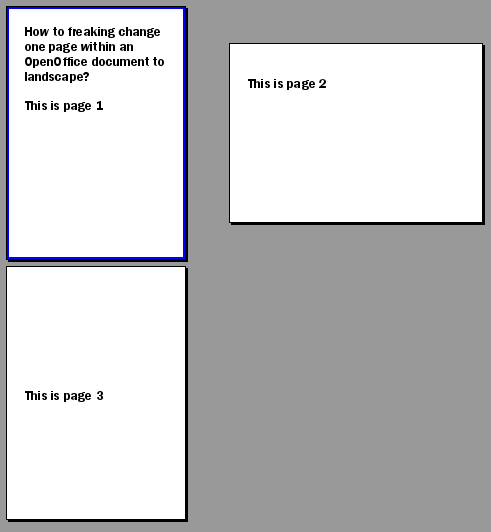 This was done in OpenOffice 3.1.1, but for different versions it should roughly be the same process. Previous: Previous post: It’s coming… Apples 3.0 on Linux!